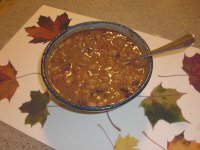 Cook up this tasty homemade chili recipe by Melonie Turley. Enjoy it vegetarian style or add meat and other optional ingredients. Tastes great with homemade cornbread. Sort (this means take out the bad pieces) and wash 2 quarts of dry beans. In the morning, drain, rinse and put in 8-quart crock-pot. Cover the beans with fresh water and add 1 large, diced onion. You can freeze the leftover beans to use later. Water (can use liquid from cooked beans). Personal preference - some people like thick chili and some like it more soupy.